On Thursday, October 22, from 6 p.m. to 8 p.m., join us as we welcome author Elizabeth Engelhardt and featured Barbecue Pitmasters from all over the state of Texas! 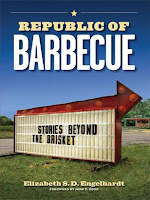 Elizabeth will be available to sign your copy of the newly, released Republic of Barbecue: Stories Beyond the Brisket. You'll also have the opportunity to meet her team of 11 University of Texas graduate student researchers, along with some of the barbecue pitmasters featured in her book. Republic of Barbecue explores the bond between barbecue and Texas culture. Prizes will be given away throughout the evening, including gift certificates to The Salt Lick, Artz Rib House and House Park Barbecue. Sweet Leaf Tea will provide complimentary tea and the Central Market Café will feature special barbecue menu items. Another event where the book we be available is the 1st Annual BBQ Bowl in Elgin. The Elgin Wildcats will host the Lockhart Lions, and a BBQ dinner for the winner from the losing Chamber of Commerce is on the line. I'll keep you updated here for any other Republic of Barbecue events.